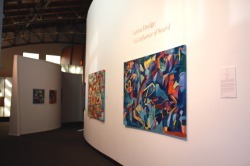 Ro2 Art is proud to announce the exhibition of Letitia Eldredge's jazz inspired paintings at The Women's Museum in Dallas, Texas -- currently on display through May 2, in conjunction with the museum's celebration of Jazz Appreciation Month. Ms. Eldredge will present speak at a special artist talk on Saturday, April 17 at 3pm at the Women's Museum. For more information on the artist's appearance, or to RSVP to the for this appearance, click here. The Women's Museum, a Smithsonian Affiliate, is located in Dallas, Texas at 3800 Parry Avenue in Fair Park. Hours of operation are Tuesday through Sunday from Noon until 5pm. To preview the paintings in the exhibition, click here. For information on works available for purchase, contact Jordan Roth at (214) 803-9575 or by email. A Confluence of Sounds with Jazz in Visual Art is the outgrowth of a conceptual framework evolved through my art exploration as fine art and in performance. Personal myth and romanticism are combined through the process of writing, then drawn into shaped non-verbal symbolism. This unique visual language connects the abstract with the figurative forms resulting in works such as this largely abstract painting series, or its preceeding often more figurative depictions which include ceramic sculpture and performance art. All content refers back to a central theme which governs my expression, that is; Art is Communication, Love is the Allegory. .
A Confluence of Sounds is the musical score for Symphony 1000. Its archetypal composers, The Jazz Telepathizers, open up on stage inviting an improvisational jazz concert derived from these series of images. The notational reading, when played by participating musicians, lifts the painted abstractions onto a vibratory plane where sound and shape immerge out of the spectrum of light captured in hues. Can there be a Painting moved into a sonar realm of tactile experience, and music moves to the fllicker of a brush?